What advice do people have about the value of a torsion axle instead of a cheaper leaf sprung axle. I'm looking to build a light weight teardrop to travel cross country with. I know I could go with a standard Harbor Freight Trailer or something similar, but I may only use the axles, rims, tires, lights, hitch, and chains. Would I be better off buying the individual components? Are torsion axles lighter due to the lack of leaf springs? I have pulled both types of trailers & I feel that the torsion axle runs much smoother that the leaf type. If you hit a bumpy road the leafs can get to bouncing pretty bad. If the bumps are just right it can just about bounce itself right off the road. It can get pretty scary when that happens. Altho as a driver you do have to use your head when driving, just slow down but sometimes ya get caught. Torsion can bounce to but I feel that they tend to smooth out bumps & don't get away from you as easy either. Just my opinion. Good luck! Torsion has built in damping (though a bit limited) and independent suspension. On the down side, it costs a little bit more, and you have to order exactly wha you need. I used a torsion and if I build another one, I'd use a torsion again. As small as most of our trailers are there isn't a huge difference. just remember to put the right size (#) on, I have seen broken leafs, bent axles and torsions that the rubber had gotten spongy because of probably just road grime and grease and oil on the road. It will depend on where you live also as cold weather makes for rubber to get hard and brittle. I have a torsion axle right now I'm replacing because it's sqeeking baddly, but this piece of equipment doesn't move much and stays out on the airport day and night. How about a four link suspension? Trailer height can be lower if you are comparing straight axles vs torsion axles. Easiest tear drop to get out of, the bed top is chair height. If you are running 15" wheels, it can be accomplished with a sprung drop axle, but the torsion axle gives a smoother ride. When you put many hours into a project, cheaper isn't always the first consideration. It is a personal preference thing. I prefer leaf springs over a rubber band axles. That said, I mean long, flat and smooth riding springs tuned to your normal loaded weight. Not cheapy HF type springs. I forgo the h/f leaf spring. It too short and stiff to help unless the trailer is really heavy. I tossed it and went with a torsion axle for a better ride (which I got) and a lower height (same as tow vehicle). 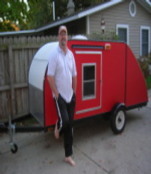 I was able to drop the trailer 4-5 inches using a torsion axle.... Also, It becomes a frame member. Looking at all of the parts involved, I doubt that there's much difference in the final installed weight of the two systems, for the same load capacity (meaning the same hubs, bearings, and spindles)... weight wouldn't be a factor in the decision between these common suspension types for me. Thanks. I'm hearing torsion is the way to go. Now.. what advice do you have about which brand of torsion axle to choose? crdouger wrote: Thanks. I'm hearing torsion is the way to go. Now.. what advice do you have about which brand of torsion axle to choose? Dexter or Flexride are both very similar and, custom ordered to your specified width and weight capacity. The only difference is, the Flexride allows you to adjust the ride height after you get it, and the Dexter is fixed. That adjustibility does make the Flexride cost more than the Dexter. You can order the Dexter with any ride height you like, bit you are stuck with that ride height. The Dexter Torflex is essentially identical to the Henschen Dura-Torque, and many local brands. The AL-KO rubber torsion suspension is very close, but the special tube shape is supposed to allow a little more suspension travel and perhaps better rubber life (it is squished a little differently). The Flexiride design has a fundamental difference, in that the rubber solidly fills the cartridge so it is twisted and it deflects more purely in shear than the with the squishing of the rubber rods in the other designs. This should be better for durability and the spring behaviour in general; good rubber spring designs work in shear. How much difference does in make in actual use? I don't know. Flexiride is definitely priced and marketed as a premium product. This advice is exactly what I was looking to get. Thanks a ton. I appreciate it. Time to start ordering parts and get building so I'm ready for the next camping season.